Big data and mobile apps combine to provide businesses that extra edge and market their services accurately with better conversion & profits. 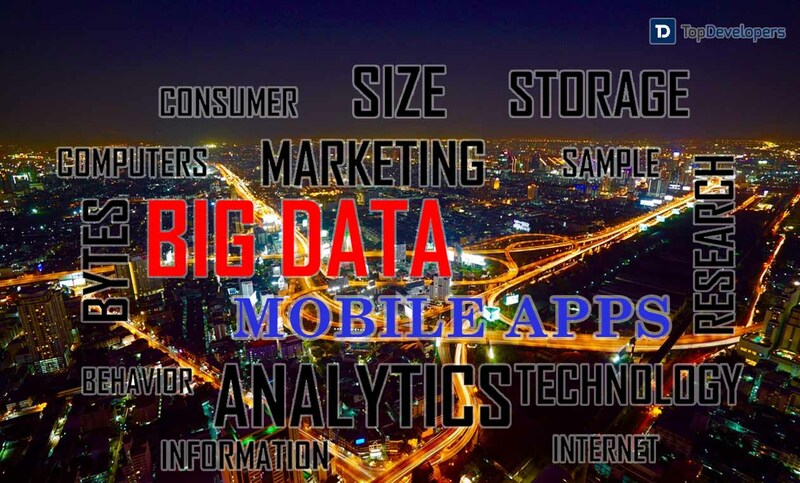 How Can Business Gain An Edge With Big Data And Mobile Apps? Today, most of the enterprise breath into mobile space. The mobile technology has become their lifeline to get connected and closer to the customers, improve the workflow and optimize the business operations. The innovation unleashed by the mobile applications generate Zettabytes of data. It seems a decade ago, mobile apps had anchored a revolution and now, it’s the turn of a data revolution. But, the large volume of data is insignificant until the businesses extract value from it. The big data analytics help in carrying out the data-driven decisions by organizing, analyzing, and leveraging the data in the right manner. How about when the variety and volume of data are valued by the businesses and integrated with mobile app analytics? It will become a big thing. Yes, the mutual relationship of big data and mobile app enable the businesses to gain insights from the data and convert it into a meaningful action. The Flurry’s analytics agent after comprehending user behavior, micro-interactions and usage patterns on a mobile app generate different reports and statistics to personalize the mobile experience. A ton of analyzing data helps the app developers to bridge the gaps and enrich user engagement. Leveraging the big data analytics on mobile app means mobilizing the business environment wearing the user’s lens. Embracing big data and mobile technology is a roadmap to get ahead of the pack without any setbacks. Meet the unmet needs of the users that even they have never realized is a secret mantra of business success. It’s possible with big data analytics. A mobile app tracks and record every action of the users from the moment users commence their mobile journey till they check out or exit the app. The grouping and proper evaluation of the huge amount of unstructured data help in knowing what are the user’s desideratum at the fingertips and in strengthening the customer relationship. For instance: Walmart, the rising star of mobile commerce with over 28 million customers has become the second most popular retailer app in a couple of years. The rare feat of increased users acquisitions is achieved with agile experimentations such as user recommendation, offline browsing and price comparison leveraging big data and analytics tools. Now, the businesses are working beyond the confines of corporate offices and it becomes important to connect the employees outside the offices. It’s all possible with mobile apps. But, with big data analytics, when the field personnel has access to the real-time information along with business resources, the things can be turned upside down. For instance: The field representative when enters the discussion with the client in the mobile app to report the sales manager, the intelligent system based on the previous interactions with the clients provides a suggestion to the representative in the real-time to seal the deal, which uplifts the chances of selling. As mobility takes the center stage in the business marketing strategy, the big data helps the businesses to market the offerings in a personalized and hyper local way. A data-driven marketing strategy is a customer-focused approach that brings impressive results. The major focus on key performance indicators and the assessment of the previous sales and marketing results, better illustrates what will work and what not, which in turn help in carrying out intelligent merchandising decisions. For instance: The mobile advertising certainly experiences overwhelming response when the customers are targeted with tailored ads based on the demographics, geography, and purchase history information. The contextual marketing in the awareness of ‘When’ and ‘Where’ elements of the users drive an explosion in the mobile advertising industry with increased revenue. The time is a killer and a delay of a second can make things go worse. The real-time action is one of the prominent reasons for the surge in the mobile apps and their adoption by the businesses. The same goes with mobile marketers as well. With big data analytics, the marketers will have more control over the data and can get insights out of the data in no time, which enable the businesses to respond the transformation with quick decisions and by making instant changes in the marketing strategies. For instance: The upselling and cross-selling in the Mobile apps is the best way to reach out the customers instantly and improve the sales volume by making recommendations on the checkout page. When the suggestions are not bringing the results, they can be changed in the middle of a marketing campaign. It’s time to wear big data lens! In the age of mobile customers, big data acts as a catalyst to reform the businesses by engineering, rebuilding, and marketing the offerings the way users want. The big data analytics is a key to enable the digital business progress and accelerate innovation with a user-centric approach. The interesting facts speaking aloud that weaving big data analytics in the mobile app has an answer to the question-“What’s next?” that businesses have. It’s stupendous! Make your business outshine by combining the four V’s- Volume, variety, velocity and veracity of big data analytics with a mobile app.